Guess whoâs celebrated their bâday on April 15th? 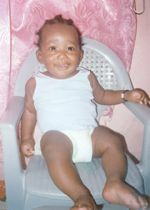 The most sweet an adorable baby for the year â05 Kareem Grant. Greetings from your mother and father Staci and Kaz, brother and sister Tiba and Ajuana, aunts, uncles, grandparents and the rest of the family circle. Wishing him all the best on his big day, and ask God for his blessing and guidance for him to see many more bâday to come. Stay sweet as UR.